How do you get your Winter Tomato on? It’s about this time when I really start missing good vegetables from the garden especially tomatoes. So in the winter time I try to find ways to get that same flavor and deliciousness by being creative with tomato dishes and condiments. 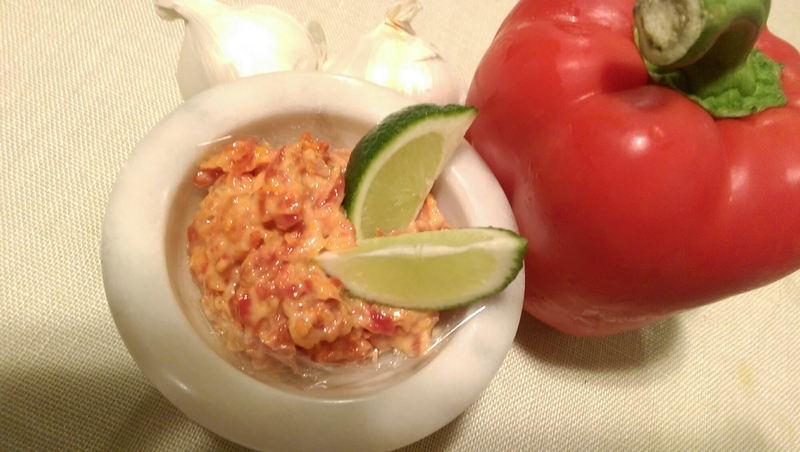 One of the ways I do this is by making special condiments for sandwiches, tonight we are having BLTs but we don’t have any of the T’s to put on our sandwich so instead I made this awesome sun-dried tomato mayo spread with a squirt of fresh lime. Another way I like to bring the taste of tomatoes into my menu during this time of year is to make a fresh tomato bisque or if you don’t have the time to do that a great way to substitute is to buy a good quality tomato bisque or Pacific brand has a red pepper and tomato soup that is really delicious. I serve it with grilled cheese sandwiches which really warms us up but also brings us that tomato flavor that we crave. Another way, is to put softened or oil preserved sun-dried tomatoes in your salads this time of year. You get that great strong tomato taste but you don’t have that tasteless pale tomato from the grocery store that this time of year really has no flavor at all. I hope y’all try some of these ideas and remember I love hearing your ideas too so don’t forget to post what you did back here and on facebook. Below is the Sun-dried Tomato Mayo. This is a very simple recipe and I urge you to be creative and make it your own. First prepare the tomatoes if you’re using the ones that are soaked in oil all you will need to do is remove them from the oil, if you use dry ones you will need to soak them in hot water for about 15 minutes with a lid on. Then you will need to put these into a small food processor with about a tablespoon of olive oil if you’re using dry if you’re using the soaked kind you will not need the oil because you will have plenty of oil on the tomatoes already. Also I added one garlic clove to about a half a cup of the finely diced tomatoes. Then you process this in your food processor, pulsing it. You are trying to achieve a chunky spread or paste not a smooth creamy paste. Next you mix the tomato paste into the mayonnaise. Again use your judgement on this. If you want a strong tomato taste use less mayonnaise if you want a light tomato taste obviously use more mayonnaise. Then you squeeze about a quarter wedge of lime into the spread. The lime really accents the tomato taste beautifully. This will last a couple weeks in your fridge. It’s great on all kinds of sandwiches. One of my favorites is Avocado, purple onion, sharp cheddar and this spread. Yum!